Good eyes! This is the Manicouagan crater. 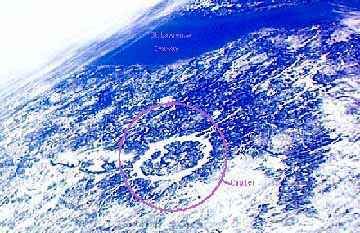 All that is left of this crater is a lake shaped like a ring--a ring 44 miles across. Giant glaciers scraped away most of this crater during the ice ages. The original crater was about 60 miles across. This crater is about 212 million years old.